The Fresno Grizzlies have been playing Triple-A baseball for nearly 20 and one-half seasons, but have yet to throw a no-hitter. Saturday night in Round Rock, Texas was as close as they've come. Right-hander Trent Thornton, in his fourth professional season, fell just four outs shy of a franchise first, limiting the opposition to a lone hit over eight shutout innings. He faced just three over the minimum (two walks, three strikeouts) as the first place Grizzlies (41-27) improved to a season-high 14 games over .500, defeating the Round Rock Express (30-38) by a 6-1 final. On a day where the University of North Carolina opened the College World Series with a victory over Oregon State, the all-UNC baseball alum battery of Thornton and Tim Federowicz (11th pro season) befuddled the Express, as the tandem worked to retire the first 15 Round Rock batters, until Tony Sanchez walked to lead off the home sixth. 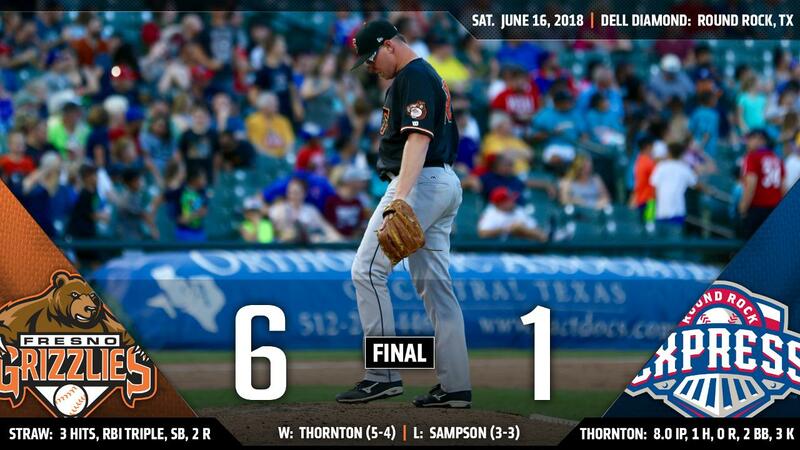 With no small amount of irony, Thornton lost the no-hitter with two out in the eighth, when former Grizz infielder Nick Noonan, playing third base and batting eighth for Round Rock, singled through the right side on the ground. While with the San Francisco Giants organization, Noonan played 294 games with Fresno between 2011 and 2014. The Fresno offense on the other hand gave Thornton far, far more than he would need. Myles Straw (3-for-5), an Astros top prospect and the current Minor League Baseball overall leader in stolen bases (all levels) with 35 for the Double-A Corpus Christi Hooks, was promoted to Fresno for his Triple-A debut earlier in the day. In his first Fresno at-bat, Straw singled after lining a fastball off the leg of Express starter Adrian Sampson. In his second at-bat, Straw doubled into the right field corner, moving Garrett Stubbs (leadoff single, 2-for-4) to third base, and he scored a batter later on a Kyle Tucker sac fly to center. Tucker's 53rd RBI of the season made it 1-0 Fresno. Still leading 1-0 in the fifth, Straw stole his 36th base of the year and first with Fresno, before J.D. Davis drew a bases-loaded single to make it a 2-0 game. It was 3-0 a batter later when A.J. Reed nearly hit a grand slam to center, but settled for his Triple-A leading 59th RBI of the season with a warning track sacrifice fly. The inning got started with Stubbs' second hit of the night, and a steal of second. The Grizzlies put the game well out of reach with three runs in the sixth. Jack Mayfield crushed his eighth homer of the season to left field, a one-out solo shot. Straw collected his third hit of the night by ripping a stand-up triple into the right field gap, scoring Antonio Nunez from first base after a walk. Straw scored on Tucker's second RBI of the night, a double laced down the line into the right field corner, making the score 6-0 for the visitors. Straw's run-scoring triple and Tucker's RBI double each came with two out. Round Rock broke up the shutout in the ninth, on a Drew Robinson RBI single. Sampson (4.0 IP, 1 R, 1 ER, 0 BB, 2 K) fell to 3-3 for the Express, while Thornton improved to 5-4, lowering his PCL-leading WHIP to 0.96 and his top-five league ERA to 2.88. Thornton has allowed just two home runs this season in 65.2 IP, and is allowing the fewest baserunners per nine innings pitched in the league. The second of the four-game set will be Sunday, and the clubs will don their alter-egos. The Fresno Tacos will play their third ever road game, after winning in New Orleans on Friday night, and June 16 of last season at Albuquerque. The Round Rock Chupacabras will be the opponent. Fresno is scheduled to start RHP Rogelio Armenteros (4-0, 3.63), against Round Rock LHP David Hurlbut (2-5, 5.54), a 1:05 p.m. first pitch.